In the context of the Venice Biennale of Architecture, this month’s newsletter will delve into a closer look at artist and architect Luciana Levinton. Artemisa Gallery is pleased to present Decontextualizing Architecture, an online solo show of her latest works. At the same time, her series of works Palais will be part of a group show curated by Sergio Bazan, in the Consulate General of Argentina, in Manhattan, NY. In these two simultaneous shows, Luciana Levinton uses architecture as the foundation for her works. As Maria Carolina Baulo states, The Grand Palais in Paris inspired a series in which she sketches facades, delineates floor plans, blurs interiors, and decontextualizes architectural elements to recreate precise figurations of architecture and bring viewers into a journey of the unknown. Strident combinations of short and long brushstrokes create phantom-like images that can be identified as buildings, though not yet fully defined. 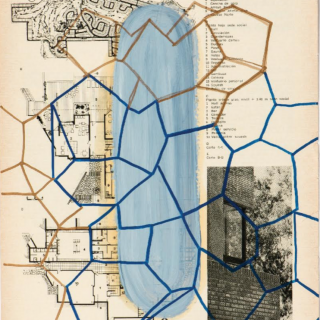 The same process applies to Levinton’s works on paper, which consist of brightly colored geometric shapes superimposed on architecture magazines from the 70’s. Viewers are invited to recognize two elements, one from the past and one from the present, as they coexist to create an aesthetic that is inherent and unique to Levinton’s work. On view online and at the Consulate General of Argentina 12 West 56th street, New York, NY, 10019. Opening Reception: Thursday July 5th, 6 pm.